This week marks the debut of the new Vertigo book Army@Love, written and illustrated by Rick Veitch. 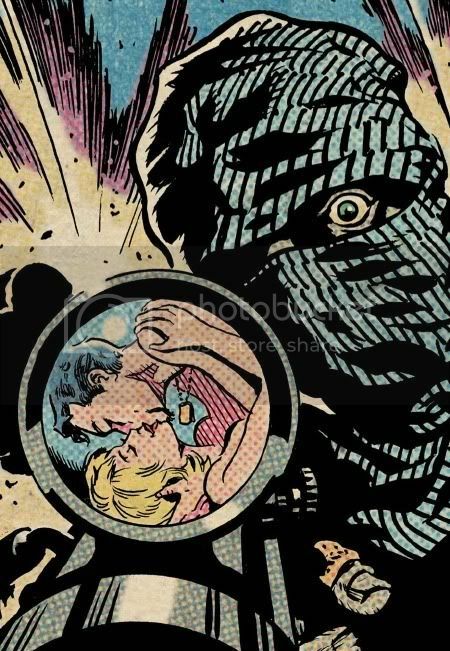 As a special preview for our readers, here’s an early look into the unexpected merger of war and romance comics, as done by one of the most creative minds in comics. And, if that’s not enough for you, tomorrow we’ll be hosting an extensive Q & A with Veitch, hitting on the societal implications of his work and his thoughts on the wars in Iraq and Afghanistan. Coming after Can’t Get No, a poetic nightmare of a reflection or rumination on the terrorist attacks of Sept. 11, Veitch follows up in Army@Love with another deep look into the psyche of America. The story takes place in “the not so distant future,” with America still stuck in protracted combat in “Afbaghistan.” The army has made some concessions to boost troop morale. Essentially, the Motivation and Morale unit encourages soldiers to mix some dirty love-makin’ with their gunfights. There’s also a story back home, which is craftily tied in by another concession made to troops: They can carry cell phones into war zones. 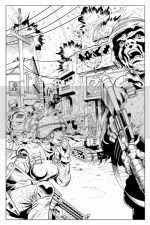 The first issue begins with a husband looking for his paisley tie while his wife battles with snipers and tries to help her husband at the same time. It’s a little touch that manages to push the story into the future without overdoing things. The book isn’t preoccupied with its setting, in other words. Instead of worrying too much about making commentary and establishing his message, Veitch focuses much of the issue on getting into the characters. 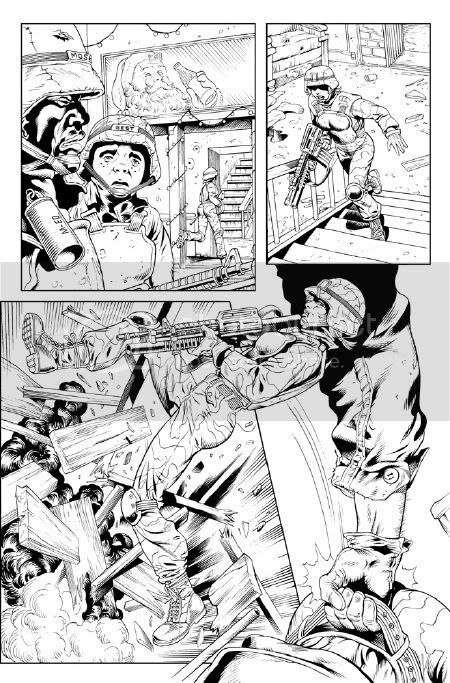 Most of the story features a female soldier, Switzer, as she’s jumping into combat duty, and her fellow soldier’s pants. Veitch twists the current war debate by having Switzer actually eager to see some action (in the violent sense). Switzer becomes almost a Lynndie England analog, though not so mentally challenged. Moreso, she’s an energetic type (and a pastor’s daughter) who’s reveling in the chance to experience the ultimate excitement, but has given over her moral judgment in the pursuit. Her husband, Loman, is the “back home” focus — a nice twist in having the man be the one watching over the homefront — and his story just barely begins in issue one. From the first page, when we see a gun holstered against his back, Loman comes across as a sort of mysteriously dark type who’s bound to fall into troubles beyond having a wife cheating on him. It’s hard to tell from the first issue if it’ll be the main plot or the secondary one, but another running thread that picks up at the end of the issue is a look inside the Motivation and Morale effort, which is expectedly coercive and corrupt, but unexpectedly diverse. Across the board, it’s a much different treatment of the military than the Marine goons from Can’t Get No. The book is also unique in its handling of the current wars, not seeking to serve as an allegorical tale or a direct condemnation, but instead a deeper psychological look into the soldiers, and those back home. For that and many other reasons, Army@Love stands up as another worthy addition to the ranks at Vertigo. I’ve always loved Veitch’s stuff.